Neglecting to create and maintain an attractive landscape can have a negative impact on your home’s value. It creates an unkempt atmosphere that discourages prospective buyers from considering the property. Whether you plan on selling your home in the near future or not, though, you should invest your time and energy into touching up the exterior. By making a just a few small changes outside, you can increase your home’s value. Pressure washing your home’s siding, the driveway, sidewalk and patio will make it look cleaner and newer. Over time, mildew, dirt and debris will accumulate on the aforementioned surfaces of your home’s exterior. This typically won’t damage the surfaces, but it can make look them dirty and dingy. Pressure washing, however, will blast away stubborn dirt and debris to restore the original appearance of your home’s exterior. If your mailbox is rusted, faded, decayed, falling over or otherwise damaged, you should consider replacing it. With an average cost of just $20 to $50, a new mailbox is an inexpensive outdoor accessory that won’t send you in debt. Just remember to fall the United States Postal Service’s (USPS’s) guidelines. Among other things, this includes positioning your new mailbox so that it’s 41 to 45 inches tall and 6 to 8 inches away from the road. Your mailbox should also feature your street address number as well as a carrier signal flag. Growing trees in your landscape can increase your home’s value. According to Turf Magazine, homes with tree-filled landscapes sell for 10% to 12% more than homes with grass-only landscapes. This is because homeowners want trees in their landscape. Trees improve the air quality, provide shade, create wind blocks and more. So, if your landscape currently consists solely of grass, try planting some saplings. They may take a while to grow — five to 20 years on average — but they’ll eventually enhance your home’s exterior and increase its value. You might be surprised to learn that adding a fire pit can increase your home’s value. 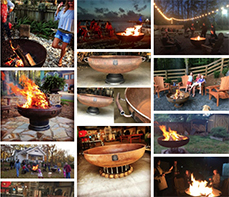 A survey conducted by The American Society of Landscape Architects (ASLS) found that fire pits and fireplaces were the most wanted accessory for outdoor living spaces in 2015. Although you can use either in your home’s outdoor living spaces, fire pits offer the highest level of versatility due to their portable design. Edging is an important step to creating an attractive landscape. If you don’t edge your driveway, sidewalks and other paved paths, you may discover weeds encroaching them. Using a string edger, however, you can define these areas to protect against weeds and other invasive, unwanted plants. Watering and fertilizing your lawn is essential to creating a lush green landscape. This is particularly true if you live in the South, where the summer heat can scorch an otherwise healthy landscape. By watering at least once a week and fertilizing a few times a year, you’ll promote a healthy, lush green landscape that makes your home more valuable to prospective buyers. The right outdoor seating can increase your home’s value. When furnishing your home’s outdoor living space, don’t use cheap plastic chairs. Instead, invest in a high-quality furniture that’s made of premium materials like hardwood or iron. A few premium chairs, swings and/or benches will create a more functional and attractive outdoor living space — something that may increase your home’s value. Mulching your flowerbeds offers several benefits. First, it provides additional nutrients to support healthy plant growth. Second, it retains moisture so that your plants don’t dry out and die. Third, it protects against weeds by covering otherwise open areas of the soil’s surface. The culmination of these effects may, therefore, increase your home’s value. To take advantage of this, sprinkle a 1- to 2-inch layer of mulch throughout your flowerbeds. You should also prune any trees and plants growing in your home’s landscape on a regular basis. Many homeowners have a linear mindset regarding landscaping. They focus all their time on mowing the lawn, neglecting the trees and plants in their landscape. When neglected, though, trees and plants will become overgrown and unkempt. You can prevent this from happening by using a pair gardening shears or scissors to prune the trees and plants in your home’s landscape. If you have a patio or deck with a covered ceiling, consider installing a ceiling fan. Along with high-quality seating, a ceiling will create a more functional outdoor living space. When the weather is hot, you can turn on the fan to create a cool and comfortable environment. It won’t necessarily offer the same cooling power as air conditioning, but it still creates a pleasantly cool breeze that’s guaranteed to keep you and your family comfortable during the summer heat.